Massachusetts OUI law prohibits driving under the influence of drugs in the same manner as driving under the influence of alcohol. In cases where there is insufficient evidence of OUI alcohol, a police officer may still believe that you are impaired and charge you with driving under the influence of drugs. Attorney DelSignore was interviewed by Fox 25 News on OUI drug charges and how these cases are proven in court. Typically, most officers will attempt to bring an OUI alcohol charge before an OUI drugs charge because it is easier for the officer to charge operating under the influence of alcohol. Attorney DelSignore receiving an award from in Atlanta from the National College of DUI Defense for his work submitted on Commonwealth v. Gerhardt: a major case on OUI marijuana in Massachusetts. A charge of OUI drugs is difficult for the Commonwealth to prove at trial. 1. The Commonwealth cannot prove what drug you were under the influence of. The Commonwealth cannot simply allege that you were under the influence of some unknown drug. They must prove beyond a reasonable doubt that you were under the influence of a drug that is listed in the law that governs operating under the influence of drugs (depressant, narcotics or stimulant). 2. Most officers are not trained as a Drug Recognition Expert (DREs). This means that the officer that arrested you may not have the credentials to form the opinion that you were under the influence of drugs and an OUI drugs case cannot be charged based on subjective information as such. 3. Expert testimony is often needed. Expert testimony is often needed to prove the impact a drug would have on your ability to drive. An OUI drug charge is often based on statements or admissions from the driver of drug consumption or based on the odor of the drug. Even if a drug was ingested, the Commonwealth would still have to prove that the drug would impair your ability to drive safely. 4. Field sobriety tests detect impairment by alcohol NOT drugs. Field sobriety tests used by officers in OUI drugs arrests were designed to detect impairment by alcohol - not drugs; accordingly, the officer’s investigation is not geared toward detecting an impairment by drugs. Like an OUI alcohol case, an OUI drugs case requires proof that the narcotic drug reduced a motorist’s ability to operate a motor vehicle safely. A recent case in Massachusetts held that field sobriety tests are not scientific tests to detect whether someone is under the influence of marijuana. This same logic would essentially apply to any OUI drug charge where field sobriety tests were relied on by the police officer. An OUI drugs charge requires the Commonwealth to prove what drug caused the impairment. OUI Marijuana case – client found NOT GUILTY! Defendant charged with OUI Drugs after police alleged his car had an odor of Marijuana lingering. The officer subsequently discovered marijuana in the car and the defendant admitted to smoking marijuana. 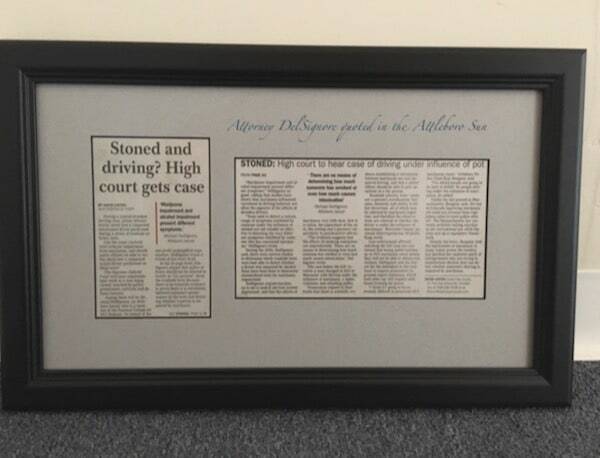 Attorney DelSignore took the case to trial and the client was ultimately found not guilty! What types of tests do police officers use to detect drug impairment? A police officer will evaluate a motorist’s, coordination and balance to determine impairment by drugs. Officers will also use a test referred to as the horizontal gaze and nystagmus test and a VGN test, vertical gaze and nystagmus. In some OUI drugs arrests, an officer will ask motorist to submit to a 12-step test referred to as a DRE evaluation. An officer suspecting a driver is under the influence of drugs may also request a blood or urine test. At trial, an experienced OUI lawyer in Massachusetts can challenge the accuracy and scientific reliability of these tests as part of the defense at trial. Contact Attorney DelSignore directly at 781-686-5924 to set up a FREE, NO-OBLIGATION consultation about a Massachusetts drug charge. The Commonwealth may rely on a DRE (Drug Recognition Expert) to move their case- learn how to challenge that evidence in Court and why it is not reliable. If the officer in your case is a DRE, it is important to understand the significance of their involvement in your case. For further reading on this topic, we recommend visiting DRE Evaluation In Massachusetts OUI Drugs Charge. To learn more about driving under the influence of marijuana and other drugs visit our website today for a detailed explanation of the charge and the penalties you may face if found guilty.